The profile inserts run along side the achilles tendon to produce uniform application of pressureand a local massage effect during movement. The integrated visco-elastic heel wedge raises the heel approx. 6mm to releive tha achilles tendon. In cases of pain or inflammation in the Achilles tendon (e.g. 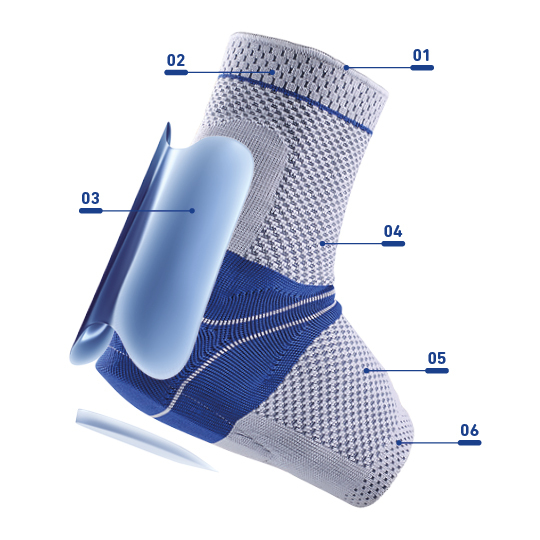 due to excessive strain or after operations), the AchilloTrain® active support helps to relieve the Achilles tendon without restricting mobility. An anatomically contoured insert (pad) produces a massage effect, thus stimulating the surrounding tissue. An integral heel cushion relieves the tendon. Edemas and effusions can thus subside more quickly. Size 1 6.75" - 7.5"
Size 2 7.5" - 8.25"
Size 3 8.35" - 9"
Size 4 9" - 9.85"
Size 5 9.85" - 10.65"
Size 6 10.65" - 11.25"